Used Noise Maker R55 R56 R57 2007-2010. This is the noise maker that comes off the intake hose connected to the throttle body. Most the time it is removed to improve performance, but if you need to reinstall it this is a cost effective option. 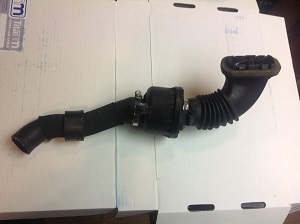 This one is a good used one removed from a MINI to install an aftermarket intake hose.